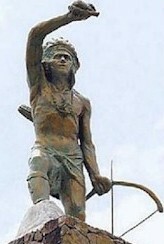 Pipil Indians, descendants of the Aztecs, probably migrated to the region in the 11th century. In 1525, Pedro de Alvarado, a lieutenant of Cortés, conquered El Salvador. independence from Spain on September 15, 1821, and was part of a federation of Central American states until that union dissolved in 1838. For decades after independence, El Salvador experienced numerous revolutions and wars against other Central American republics. From 1931 to 1979 El Salvador was ruled by a series of military dictatorships. In 1969, El Salvador invaded Honduras after the Honduran landowners have been deported by the thousands of Salvadorans. The four-day war known as the “football war” because it broke during a football match between the two countries. 30,000 people were killed by death squads backed by the military right. Jose Napoleon Duarte, a moderate civilian who was president from 1984 to 1989, offered an alternative to the political extremes of right and left, but Duarte was unable to end the war. In 1989, Alfredo Cristiani, right-wing Nationalist Republican Alliance (ARENA) was elected as president. On January 16, 1992, the government signed a peace treaty with the guerrillas and was formally end the 12-year civil war that killed 75,000 people. happened z the country in the summer, when a severe drought destroyed 80% of the country’s crops, causing famine in the countryside. In 2004, Antonio Saca of ARENA, was elected president. The nation of El Salvador had a free trade agreement (FTA) with U.S. in March 2006 and the first Central American country to do so. Mauricio Funes, a former journalist and member of the FMLN party, was elected president in March 2009, ending two decades of Conservative government in El Salvador.